The H300-3 horizontal post box offers a generous capacity of just over 37 litres within dimensions of 300 x 330 x 375mm (width, height, depth). A popular choice for communal receptions, student accommodation blocks, and mixed-use office buildings, it is the perfect multiple occupancy mailbox for high traffic areas. The H300-3 letter box can be banked together with other models in the range to create a single unit of multiple mailboxes or letterbox banks. 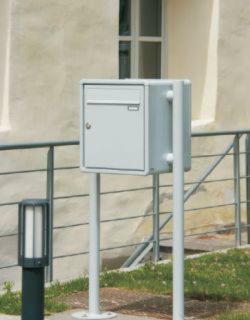 Post Boxes UK offers a full design and installation service for commercial and residential properties of every size. Please contact us to discuss your mail box requirements. While commonly displayed as a freestanding unit with support legs, the H300-3 Secured by Design letterbox can be both wall-mounted and wall-recessed to create a more robust and permanent structure. With 15 standard, another 180 non standard, any number of multi-RAL colour combinations are available for the H300-3 horizontal postbox. We also offer flame retardant and fire resistant options for buildings that must meet the Building Control and Fire Regulation Standard BS476 (Class 0), London Underground specification. In most cases, Post Boxes UK will supply and deliver your mailbox bank within 4 weeks of receiving your order. Our lead times depend on the size and complexity of each project. Please contact us for a tailor-made plan. Designed to withstand harsh weather conditions and everyday wear and tear, the H300-3 communal letter box is manufactured from a robust 1mm electro-galvanised steel and stainless steel. Suitable for indoor and outdoor installations. Post Boxes UK offers a number of finishing surrounds and framing options for the H300-3 post box. For wall-mounted and freestanding mailboxes, we offer 2mm sheet surrounds and 20mm surrounds for a smart and professional finish. Wall-recessed letterbox banks can be framed with 20mm or 40mm finishing surrounds to create a picture frame effect, or we can customise a bespoke finishing surround to suit your exact needs and requirements. The H300-3 freestanding post box comes with a choice of leg options to complement all indoor and outdoor locations. We currently offer side support legs, pedestal legs, and combinations for larger banks. 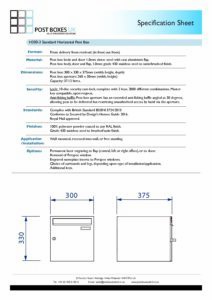 Please bear in mind that the EN13724 maximum recommended height for letter banks is 1800mm from finished floor level. H300-3 multi-unit post boxes can be customised with a choice of options. We can add apartment numbering, identification codes, nameplate inserts, or company branding with our bespoke engraving a laser etching service. While all H300-3 letterboxes for flats come with Eurolock cam locks as standard, Post Boxes UK offers a variety of different locking options for those who require a more thorough security solution. Salto compatible locks, master keyed suites (UMK), and padlock compatible cam locks all feature in our range. Please contact us to discuss your specific requirements. Should you require additional sets of keys and replacement locks for your H300-3 horizontal mailbox, Post Boxes UK is here to help. We can provide any number of replacement keys for your mailboxes and offer discounted rates for bulk purchases. 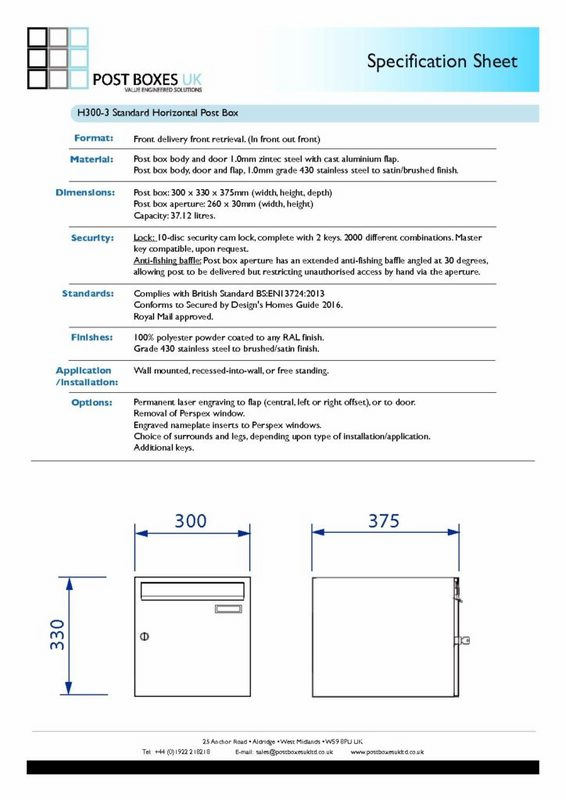 For your peace of mind, the H300-1 commercial mailbox meets the requirements outlined in the Secured by Design Homes Guide 2016. Each box is fitted with an anti-fishing device to prevent tampering and they are EN13724 approved. The H300-3 post box is a large mail receptacle that can easily accommodate A4 size documents without the need for folding the envelope. A high-capacity mailbox for busy communal properties, it is well suited to larger office blocks that receive mail in bulk on a day-to-day basis.